Apples and cinnamon those two flavors go great together. 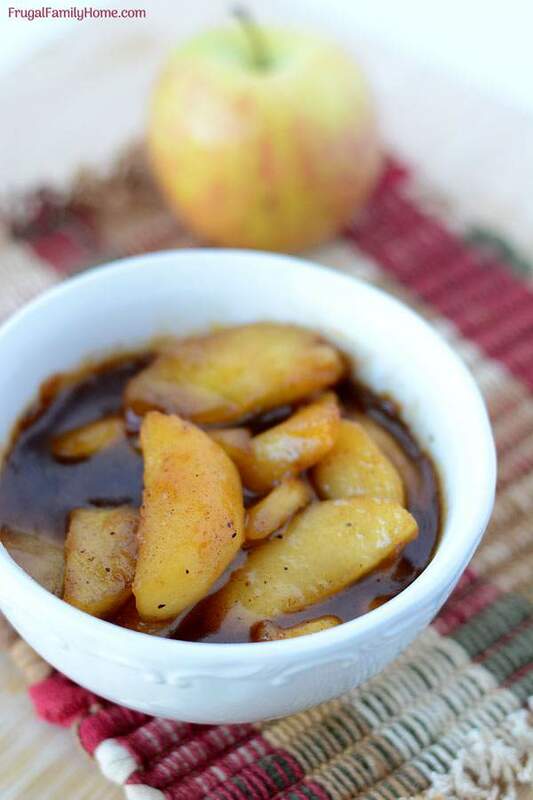 This sauce is a great way to enjoy apples if you haven’t made it before here’s how to make cinnamon apples. They are delicious! During fall apples seem to be everywhere. In the store, at the farmers market or farm stand. They are so fresh and crisp it’s hard to not bring a bushel of them home. 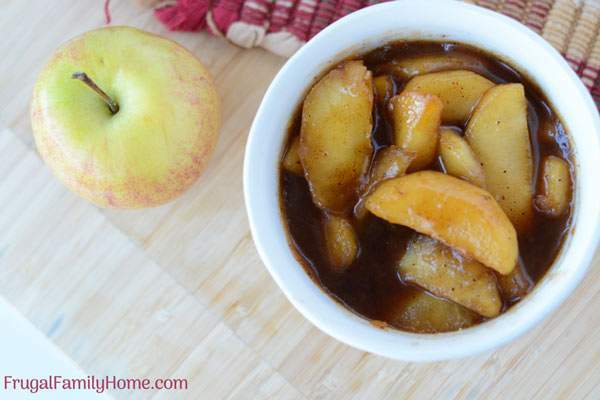 When you find a great deal on apples why not make this yummy sauce loaded with apples. Cinnamon apples are great on so many things or eaten right out of the bowl warm. If I’ve got you wanting a few cinnamon apples of your own keep on reading down to get the recipe and watch the recipe video. 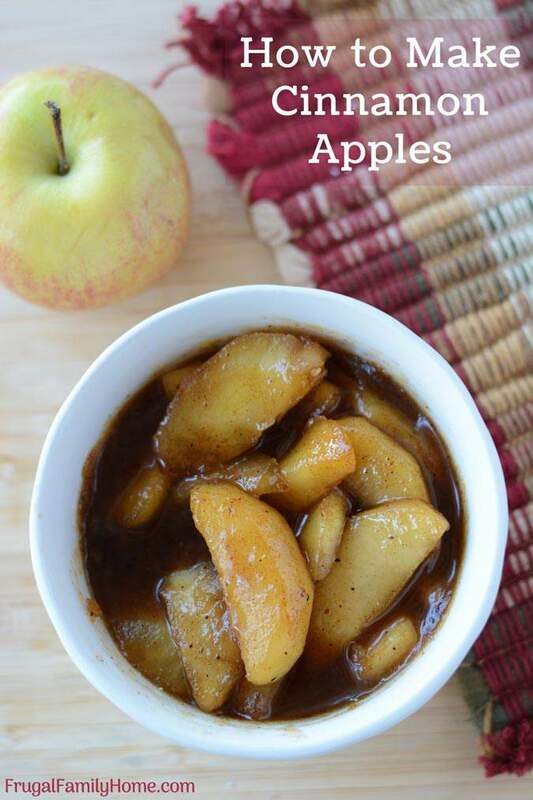 The steps and tips below will show you how to make cinnamon apples without any added water or cornstarch but still have a nice syrup on them. They are quick and easy to make and so delicious. Watch the video below or scroll down for the written steps and the printable recipe. Cutting the apples. Make sure to slice the apples a little thick. If they are too thin they can become mushy quickly while cooking. Slicing the apples thicker helps them to stay tender crisp. If you slice the apples on the thin side they will cook more quickly. Dissolve the Sugar. Be sure to let the sugar fully dissolve and if the pan is too warm and it’s trying to burn be sure to turn the heat down. You want the sugar fully dissolved but not burnt. Mix the spices. Mix the cinnamon and nutmeg together and then sprinkle it over the apples to get it distributed well. Be sure to stir it in good too. Using a knife slice the apples of the core. Melt butter or coconut oil or margarine in a skillet over medium heat. Add the apples and lemon juice. Let cook until tender crisp. Don’t let the apples overcook and get mushy. Sprinkle the sugar over the apples and stir or toss to combine. Continue to cook the apples until the sugar is fully dissolved. You may need to turn the heat down to keep the sugar from burning. You want the sugar to thicken and really coat the apples like a thick syrup. Remove the skillet from the heat and sprinkle with the cinnamon and nutmeg. Stir to combine. Now that you know how to make cinnamon apples you might be wonder how to serve them. They are really quite versatile. They would be great at breakfast over waffles, pancakes, or even french toast. Spoon a few spoonfuls of these yummy cinnamon apples over top for a delicious fall breakfast treat. They also make a great side dish or dessert all on their own. Serve warm in a bowl and I’m sure they’ll eat gobbled up by the whole family. Another way to enjoy these cinnamon apples is to add them as a topping to ice cream. 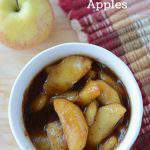 Ice cream is good any time of the year and these warm cinnamon apples would make any plain bowl of vanilla ice cream so much better. You could even make apple shortcake with these cinnamon apples for a yummy unique fall dessert. To make apple shortcake make a batch of biscuits but add a couple of tablespoons of sugar to the dry ingredients and prepare the biscuits as usual. Make a batch of cinnamon apples. Split the biscuits and spoon the warm cinnamon apples over the biscuit and top with a little-whipped cream. You’ll have a delicious fall dessert to serve your guests. How Much Does a Batch of Cinnamon Apples Cost? 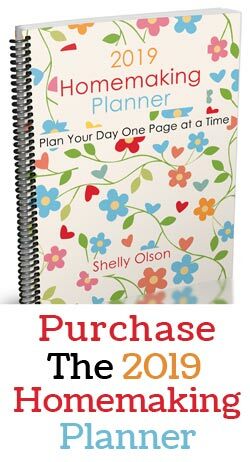 I often break down the cost of recipes for two reasons you know how much it cost to make each recipe. 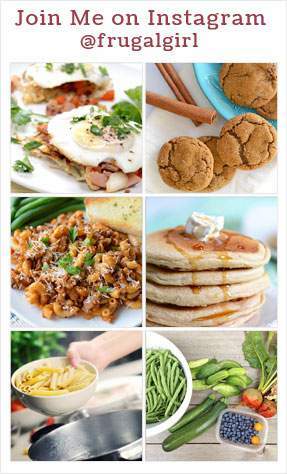 Second, you can plan more inexpensive meals when money is tight or when you want to save more money. Freeing up a little extra money in the budget without sacrificing your family’s favorite meals. To figure the price of this recipe I used the average price of apples available in the fall, just under $1 a pound. Since most large apples weigh about half a pound I figured the cost of the apples to be $1 for this recipe. The spices and sugar I used bulk food prices which might be a little more or a little less in your area. But if you do have a store near you to purchase spices in bulk they are normally a lot less expensive purchased in bulk than the small jars. The rest of the ingredients I used everyday prices for our area. The lemon juice in a bottle is about $1.59 for a large bottle and margarine is about $1.70 for a pound. If you use butter the cost will be a bit higher. Total for one batch of these cinnamon apples turned out to be $1.24. If you’re eating these for a dessert or as a side dish the recipe would make enough for about 3 people. If adding to the top of pancakes or waffles you might be able to stretch it to 4 people. Making each serving of cinnamon apples cost between $.31 to $.41. Not too bad at all and these are so yummy and easy to make, they are hard to beat. That’s how to make cinnamon apples. I hope now that you’ve seen how easy they are to make you’ll give them a try for yourself. What’s your favorite apple dessert to make? Your welcome Erin, they are really simple to make and so yummy too.